Shri Baglamukhi sadhna is known as brahmastra in modern era, it has atomic powers and indeed it is a victory giver. Bagala or Baglamukhi is the eighth Mahavidya in the famous series of the 10 Mahavidyas. She is identified with the second night of courage and is the power or Shakti of cruelty. She is described as the Devi with three eyes, wearing yellow clothes and gems, moon as her diadem, wearing champaka blossoms, with one hand holding the tongue of an enemy and with the left hand spiking him, thus should you meditate on the paralyser of the three worlds. Seated on the right of Bagala is the Maharudra, with one face, who dissolves the universe. Bagalamukhi means "The Crane-Headed One". This bird is thought of as the essence of deceit. She rules magic for the suppression of an enemy's gossip. These enemies also have an inner meaning, and the peg she puts through the tongue may be construed as a peg or paralysis of our own prattling talk. She rules deceit which is at the heart of most speech. She can in this sense be considered as a terrible or Bhairavi form of Matrika Devi, the mother of all speech. According to Todala Tantra, her male consort is Maharudra. 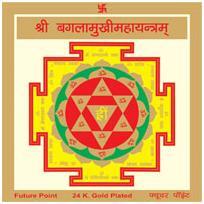 This yantra also offers protection for cuts, scars, operations and accidents. Any person using this yantra while in court every time gets success. This is practical use of this yantra. It is well tested by many people. After pran pratishta, yantra shall be placed at puja place or in house temple on wooden chowke (table) over which yellow asana be put. The puja be performed after bath. Take the water in right hand, recite the baglamukhi beej mantra and sprinkle water on yantra, your all wishes would be fulfilled. Expounding the great power of the Goddess Baglamukhi the text Mantra Maharnnav states -"The Mantra of the Goddess has the power of the divine weapon Brahmastra instilled in it and the Goddess simply strikes terror in and paralyses the enemies of her Sadhaks. Repetition of her Mantra is enough to stop even a tempest." What more can be said about this invincible Mahavidya who along with her 16 Shaktis (divine weapons) can subdue the most formidable of foes. Her greatness has been proven time and again over the ages. And not just great Siddhs like Matsyendranath, even rulers like Vikramaditya, Chandragupt and Aurangzeb regularly propitiated the Goddess for victory in life. The great western Tantra scholar Summerfield has gone so far as to state that the combined forces of the whole world cannot face the fury of the Goddess, who removes poverty, enemies, tensions with a single swipe of her sword. And I have myself seen several Sadhaks and disciples of Gurudev regain their lost positions and emerge victorious in seemingly lost battles of life through the power of Baglamukhi Mantra. Baglamukhi Yantra is said to be very powerful mean to overcome enemies and competitors. One can protect himself from his enemies and also can protect his love one. All the material used in the pooja of Shri Baglamukhi should preferably be yellow colored. Such as Haldi Mala (turmeric), yellow cloth, yellow flowers, yellow sweets, yellow asan (a cloth on which you have to sit) and to keep Shri Baglamukhi Yantra. Shiro may Bagla patu hriday may kakch ri para. Om hreem om may lalate ch Bagla vairi nashinee..
Gada hastaa sadaa paatu mukham may moksha daayinee. Vairi jihwaadharam paatu kantham may Baglamukhi..
Udaram nabhidesham ch paatunityam paraatparaa. paraat partaraa paatu mamguhayam sureshwaree..
Hastau chaiv tatha paadau Paarvatee paripaatumay. Vivaaday vishmay ghoray sangramay ripu sankatay..
Shrividya samayaa paatu maatangee puritashivaa..
Paatu putram sutam chaiv kalatram Kaalikaa mam. Paatu nityam bhraatram may pitram shoolinee sadaa..
Randhrey hi baglaa devyaah kavacham manmukhoditam. Naiv deyam mukhyaaya sarvasiddhi paradaayakam..
Pathnaadhaarnaa dasya poojana dwanchitah labhet. Idam kavacham gyatvaa yo japed Baglamukhem..
Pibati shonitam tasya yoginayah praapya saadaraah. Vashye chaakarshanay chaiv maarnay mohanay tathaa..
Mahaabhaye vipattau ch pathedwa paathyettu yah. tasya sarvaarth siddhih syaad bhakti yuktasya Paarvati..
Iti Shri Rudrayaamalay baglamukhee kavacham Sampoornam. Then take yellow flowers and rice in both hands and chant this. Om asya Shri Baglamukhee strotasya, Bhagwan Narad rishih, Baglamukhee Devtaa mam sannihitaanam dushtaanaam virodhinaam vaangmukh pad jihva buddhinaam stambhnaarthe Shribaglamukhee varsaad siddhyarthe jape viniyogah. Om hreem angushthabhyaam namah. Om Baglamukhee tarjaneebhyaam namah. Om sarvadushtaanaam madhyamaabhyaam vashat. Om vaacham mukham padam stambhay anaamikaabhyaam hum. Om jihvaa keelaya kanishthakaabhyaam voshat. Buddhim naashay naashay. Om hreem swahaa kartalkar prishthaabhyam phat. Aivam hridyadishu nyaset. Hemaabhaam susuchi shashaank mukut sacchampak sragyutaam..
Hastair mudgar paash vaddharasnaam, samvibhrateem bhooshneh. Vyarpatangee Baglamukhee trijagtaam sanstambhineem chintaye..
Om Hreem Lreem Baglaamukhi Sarva Dushtaanaam Vaacham Mukham Padam Stambhay Jihvaam Keelay Buddhim Vinaashay Hreem Lreem Om Swaha. Om Hleem Lreem Baglaamukhi Mam Dushtaanaam (name of the person) Vaacham Mukham Padam Stambhay Jihvaam Keelay Buddhim Vinaashay Hleem Lreem Om Swaha. Dear readers, here you need to note the difference between the two mantras, in the first mantra which has to be used in case of all the enemies, use “HREEM”, and in case of a particular enemy use “HLEEM” and the name of the enemy should be used for maximum results. Note – We will send you a complete set of Shri Baglamukhi sadhna, All mantras, and procedure along with the above Yantras, free of cost. To place your orders You may forward your request with your Cheque, Demand Draft or Money Order, For the account of “ASTRO MEDICINE RESEARCH CENTRE”, payable at Mussoorie, Uttarakhand.